The UPDF rolled out its hardware for the public ahead of the Feb 23 elections. This event marks a significantly hawkish tone by the incumbent before the elections. The President after coming face to face with significant sections of opposition on the campaign trail has retaliated using the fear factor to control his vote slippage. At the same time, it is not clear whether all is well inside the UPDF. 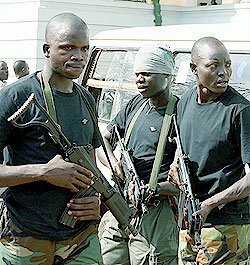 The Sunday Monitor 1.29 reported that soldiers were protesting non-payment of salary arrears. The pre-election mantra that soldiers would remain independent of politics is wearing thin. Defense PS Noble Mayombo 41, has been accused of running errands for the ruling NRMO. Brig. Kasirye Gwanga 62, has been appearing publicly on behalf of NRMO candidates in Buganda. At the same time, UPDF appears to have suffered some casualties recently in the north. Lt. Col.Magezi a long standing UPDF officer and CDR of the 505th Brigade in Northern Uganda died from gunshot wounds suffered during an LRA attack.